Storm Roofing (Southern) - Fascia/Soffits/Guttering, Roofer based in Crawley, West Sussex. 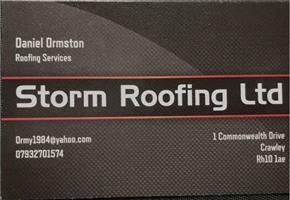 Storm Roofing is a reliable, honest and affordable company . We provide a high standard of work, take pride in every job we do and have over 15 years experience. We specialise in all aspects of flat roofing, tile or slate roofing and guttering.